Back then my life was that of a full-time pill junkie and alcoholic. I didn’t have a job because I couldn’t keep one, I had no money because I didn’t have a job, and whatever pennies I could scrape up were invested in drugs and alcohol. My wife of five years got fed up and walked out the door never to return, she took our one car and our pets. I was left with nothing, I was nothing. My parents were convinced I was going to die; having nothing else left I dedicated myself to my self-destructive vices. I had gotten into the habit of leaving the house late at night and walking to some of the sketchiest parts of town, trying to get my fix, sometimes even without money. Needless to say, this was quite dangerous, and I got myself in a pickle or two from time to time. Mom and Dad begged me to seek medical help; they couldn’t control me any longer, or watch me twenty-four-seven to keep me safe. I hesitantly agreed, still thinking that if I went to the hospital they would give me more drugs to calm me down and I wouldn’t need to be struggling to get them out there. When they said that they were going to need to keep me for a few days, that’s when reality really set in. They took me up to the third floor, strip me of the few possessions I owned and put me in a hideous green gown. As I waited for a room to be ready, I sat in the lounge of the psychiatric floor, apprehensively studying my surroundings, and freaking out a little. The world was completely different up here. It didn’t move at the same pace. There was constant activity all over; people of all walks of life, with all sorts of illnesses, cohabitating in the most dysfunctional of ways. Some of them looked zombified, dragging their feet at a constant pace. Others were the opposite, they almost bounced off the walls with child-like energy. Some talked to themselves, others didn’t talk at all. Being there was almost like being thrown in the middle of the jungle without survival gear, the whole place felt like it was being balanced on a tight rope that was about to snap. As time passed, a few patients came over and introduced themselves, some of them even said that they wanted me to feel safe. That meant a lot to me. I could talk and communicate with them in a surprisingly easy way. As time passed and I became more accustomed to my surroundings, I realized that I had made the most fundamental of mistakes, the one everyone else also makes; these people, although flawed and maybe even a little broken, were still human, and still possessed the traits that every other human has, the main one being love, and they showed that to me in many ways. I spent a week in the hospital, and in that time, I experienced many things. I saw the horror that some mental illnesses put some people through, and it made me feel a great deal of empathy for them. I saw the love that people can show others no matter what, as love has no limitations or handicaps. I was taken aback by the kindness and the humanity of the people that I came in contact with, and that, to me, remains infinitely special. Although I witnessed many sad things as well, I was reminded that we are all, oh so fragile in the end, but our love and our humanity remains. I felt blessed to experience all these things, and to meet the people I did. 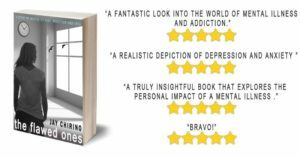 The Flawed Ones tells the story of my stay in that psychiatric hospital, and the stories of the people around me, the ones that I really wanted to honor and give a voice to. I would be delighted if you signed up to be one of 100 readers to receive a free digital copy of the book here, even before it gets released for sale.